To make measurable gains in lean mass, we have to feed our muscles the proper combination of high-quality nutrients: proteins, carbs, vitamins, and fats, along with other key tested-proven compounds. The issue is of getting all the nutrients our body needs from food alone. To take our gains to the most next level, we must take advantage of muscle- building supplements, such as Creatine, BCAAs, Glutamine etc. ISO MASS XXL was developed to be a lean gainer- not just a high-calorie weight gainer- so it’s best for those looking to gain lean mass without taking in way too many calories! 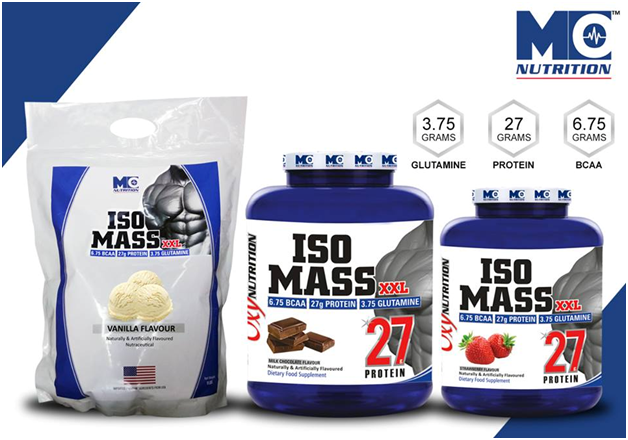 Unlike other weight gainers that are loaded with sugar and another low- grade calorie sources, ISO MASS XXL is formulated with the highest quality ingredients and tested muscle-building compounds. The forward-thinking minds at MuscleOxy Nutrition are the geniuses behind this incredible product. Within a short span of time, MuscleOxy Nutrition has won the Heart and Trust of the nation and capture 400 Cities and in 19 States Of India. It’s no surprise that ISO MASS XXL is already one of the top-selling gainers. You don’t need to buy every individual supplement out there because you can get the benefits of them all at the same time by simply using ISO MASS XXL. Branched-chain amino acids (BCAAs) are one of the must-have muscle-building supplement. 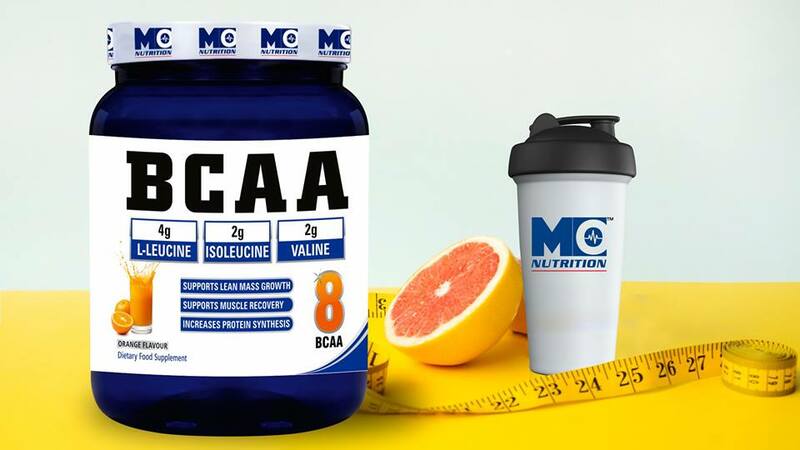 BCAAs contains this three essential amino acids: leucine, isoleucine and valine. Research shows that BCAAs can help improve strength, endurance, and overall athletic performance! ISO MASS XXL contains added BCAAs, not only because of their muscle-building effects but also because the body can’t make them. The only process to get them is through food or supplementation. Bodybuilders and athletes consume their glutamine stores through intense training, which can reduce the rate of muscle growth and recovery. 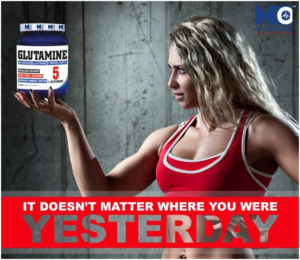 Muscle tissue is the main storage site for glutamine, and maintaining a high saturation level can activate a pour of physiological events that increase protein synthesis (i.e., muscle growth). That’s why glutamine is one of the supplement every bodybuilder and athlete should use. 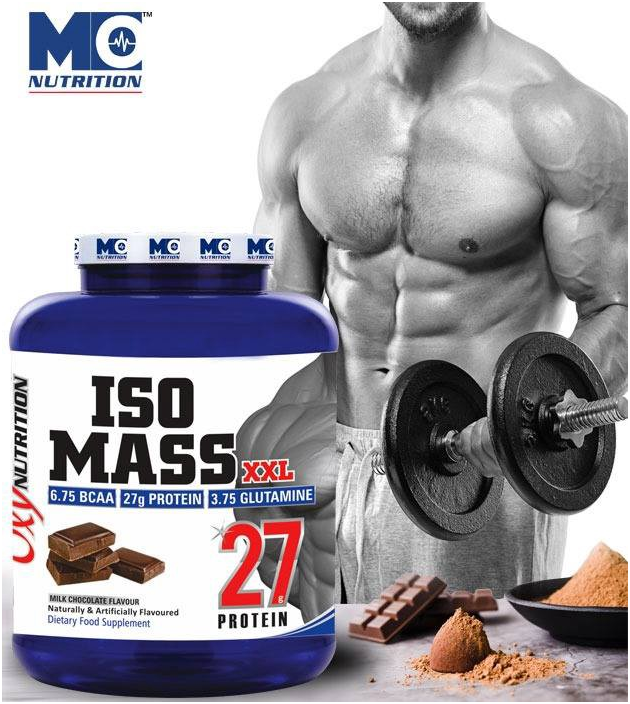 Anyone looking to make quick top-quality gains in lean mass should surely be using ISO MASS XXL, especially when you observe its impressive ingredient profile ISO MASS conveniently covers all your musclebuilding supplement needs in one appropriate formula, and on top of all that, it tastes great too! Available in Milk Chocolate, Vanilla, Strawberry, Cookies ‘n’ Cream flavors. MuscleOxy Nutrition ISO MASS XXL is an extreme weight gainer formula with 27g of protein, 3.75grams of glutamine and 6.75grams of BCAA. Mix 3 scoops with 16 oz. of cold water or any drink of your choice. Increase the amount of liquid to achieve your desired consistency. Drink 1 serving daily, or as needed to convince your protein or mass-gaining requirements. To increase your protein and calorie intake per serving and for an amazing milkshake taste, use milk.